Wild: Ranging from eight to twelve feet tall, Phorusrhacidae Rapidesultor is a highly aggressive avian that is just barely capable of very brief “flight”. Instead, it uses its wings primarily for balance during its high-speed sprints. Phorusrhacidae flight is actually closer to an impressive sustained leap or glide that is assisted and lengthened by flapping its wings. Domesticated: Phorusrhacidae is an excellent combat mount, particularly for harassing and scouting. Riders of Phorusrhacidae gain most of the benefits of a fast, mobile ground-based theropod, while also gaining some of the freedom of movement from a flyer… Assuming the rider can coax Phorusrhacidae into staying in the air over a long leap. 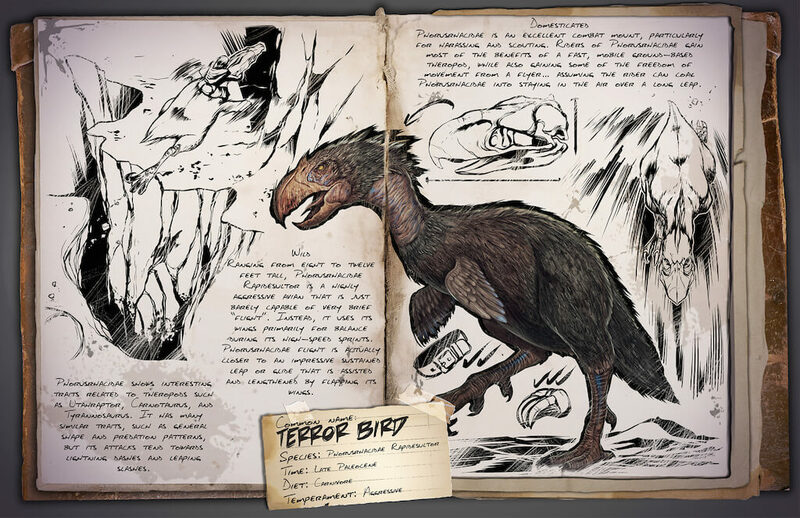 Known Information: Phorusrhacidae shows interesting traits related to theropods such as Utharaptor, Carnotaurus, and Tyrannosaurus. It has many similar traits, such as general shape and predation patterns, but its attacks tend towards lightning dashes and leaping slashes.